Teriberka is a small settlement on the northern shore of the Kola Peninsula. Founded in the first half of the 17th Century as a seasonal fishing base, it soon became a major fishing centre. In the 1960s, with the arrival of superships, Teriberka’s fishing industry began to decline. The settlement had nowhere to register the arrivals and departures of fishing vessels, which forced fishermen to put in at the nearby regional capital, Murmansk. 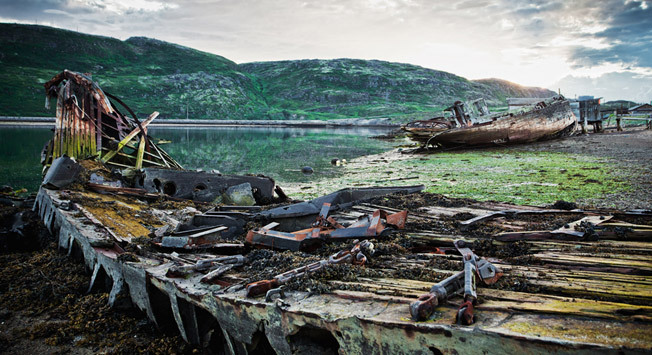 Today, the settlement’s main attraction is the ships’ graveyard on the shore of the Barents Sea (a marginal sea of the Arctic Ocean). Built as a defence installation on an artificial island in the middle of the Gulf of Finland, Fort Alexander I (named in honour of the brother of Nicholas I) never took part in any military action. At the beginning of the 20th Century, when there was an outbreak of bubonic plague in Europe during the Third Pandemic, it was transformed into a laboratory to develop a plague vaccine. So that the vaccine’s effectiveness could be tested on horses, the fort was fitted with a lift to take the animals to the lab, steam heating for the stables and a cremation incinerator. Despite strict controls, there were two outbreaks of plague on the island. At present, trips to the Plague Fort still take place but there are plans to convert it into a leisure complex shortly. When the Plosky Tolbachik volcano on the Kamchatka Peninsula erupted in 1975, it continued for a full year and a half. During that time, the lava burnt off the taiga forests that grew on the volcano’s slopes. Kilometres of adjacent territory were engulfed in ash and slag. The volcano deserts so resembled the surface of Mars that the first Soviet moon and Mars rover vehicles were tested here. Entire forests were buried under a seven-metre layer of ash. Nothing grows there still, even after 39 years. The settlement of Piramida, which is on the same latitude as central Greenland, grew up around the most northerly mine in the world, which extracted coal. "Most northerly” can be prefixed to everything here: the “most northerly statue of Lenin”, “the most northerly swimming pool in the world”. In the heyday of the USSR, several tonnes of chernozem black earth were brought to Piramida. Incidentally, walking on the lawn grown on this “Russian earth” was forbidden. In addition to this unusual ban, there is also a law against dying in the archipelago (a legal prohibition of death). Should someone die on the island, the body will nevertheless be buried on the mainland. Bodies do not decompose after burial in permafrost but do attract the attention of polar bears and other predators. Piramida was mothballed in 1998 when coal mining came to an end. The city of Vorkuta in the permafrost zone was famous in the mid-20th Century as the centre of the biggest camp in the Gulag and as a frequent place of exile as late as the 1980s. Nevertheless, the city was intended for something quite different. As a worker’s settlement, Vorkuta was founded by geologists on the site of known coal reserves. Even now it is surrounded by a whole system of townships (population centres at individual mines with a total population of 130,000) that make up the Vorkuta Ring. There were seven towns on this circular route with a radius of 50 km that ran through Vorkuta. Now, in connection with the Far North resettlement programme and the closure of the coal mines, only five out of 13 productive mines remain and only two of the five settlements are still inhabited. The empty settlements have become ghost towns, “frozen” amid the snowbound tundra. The now abandoned Magadan-Yakutsk Highway, built by prisoners of the Gulag, is known as the “Road of Bones”. It was built in the harsh conditions of the camps, often in extreme cold. Tens of thousands perished. The road ceased to function when the bridges built in the 1930s began to collapse. The Indigirsky Corrective Labour Camp (Inlag) is one of the least known death camps of the Gulag system. Construction of a railway tracing the Arctic Circle from Salekhard to Igarka was one of the most ambitious of the Gulag projects. Despite horrendous natural conditions – swamps, temperatures that reached -50 C, and the lack of roads – construction proceeded rapidly, with prisoners laying up to 100 km of track a year. Unlike other “great construction projects of Communism”, the Transpolar Mainline was always “dead”. Although it has been partly dismantled, it is still possible to see almost untouched bunkhouses, houses, stations and rusting engines beside the track. There is now a Transpolar Mainline Museum in Salekhard.